Apps, Alisa — A singer from Los Angeles has reportedly challenged Lady Gaga to a live, televised “sing-off” to let the public decide whether they like their stars “real or plastic,” with the winner taking home a million dollars. Sources say Lady Gaga, upon hearing of the challenge, sat down in a chair, took a sip of coffee, thought about it for ten seconds and made a million dollars. Beckham, David — MTV UK (which keeps waaaaay better tabs on the soccer star than anyone stateside) reports that Beckham and family were recently spotted in Philadelphia’s ritzy Barclay Prime restaurant, where he reportedly spent $100 on a particularly high-grade philly cheesesteak sandwich. While we respect the attention to the finer things, Becks, that seems like an awful lot of money to spend on something that your wife is only going to pretend to eat and secretly throw away later when you aren’t looking. Bourdain, Anthony — A subset of DC Comics called Vertigo has announced that culinary star Anthony Bourdain will be collaborating with illustrators to present a graphic novel called Get Jiro! which features a “mysterious top-notch sushi chef” targeted by those who wish to procure his secrets and, according to Vertigo, will be “a futuristic action thriller that takes America’s newfound obsession with exotic cuisine to a manic, violent extreme.” Time and time again we here at TBTS bemoan the state of the creative industry, but big ups to what sounds like a truly imaginative idea. I always knew the next great idea would come from a movie producer screenwriter television executive chef. Duhamel, Josh — The Life as We Know It and Transformers star tells the website Movie Hole that Michael Bay doesn’t give him much more to do on the Transformers set than “running this military team that either is shooting at, or running away from robots and screaming orders,” and that he consistently has pitched ideas to them which have been ignored. Although to be fair, most of his pitched ideas allegedly involve his character, Cpt. William Lennox, getting surprised by robots while he’s in the middle of rubbing coconut oil onto his shirtless chest, and that doesn’t seem particularly germane to the plot. The Napoleon Dynamite animated series: Striking while the iron is hot! 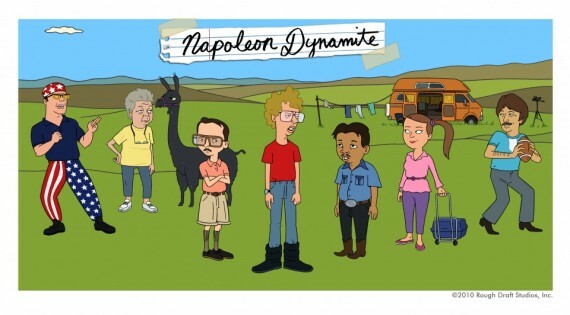 Dynamite, Napoleon — FOX has reportedly ordered six episodes of an animated series based on the stellar indie cult classic Napoleon Dynamite which will reunite the original cast and deal with the further adventures of the title character in an Idaho high school. This is a good early warning, people. If I were you, I’d take up boxing now, because you’re going to need the stamina to take on all the people you are going to want to punch to death for incessantly quoting a whole new batch of Napoleon Dynamite lines weekly. Lambert, Adam — The envelope-pushing American Idol runner-up tells reporters that he will adhere to government restrictions placed on an Malaysian concert this evening which will hamper some of the flamboyant showman’s notorious on-stage behavior. And that means sorry Malaysians — you’re just going to have to find someone else to watch dry-hump an alien in a sequined wrestling singlet tonight. Miners, Chilean — In a society where contestants willingly put themselves in tight, enclosed or far-flung places — hermetically protected by cameras and off-screen crews — last night we saw a far greater victory than in any reality television show. It was a victory over reality itself. Yesterday the last of thirty-three Chilean miners trapped underground for 69 days was brought to light, and our hearts, compassion and congratulations go to them and their relieved families. They are the true survivors, not some twenty-three year old bartender from L.A., and I’m sure we join the rest of the world thankful for this miracle over the odds. Welcome back, gentlemen. You didn’t miss much.